What kind of price do they run? How about taking a piece of scrap wood and make a hand rest that will slide onto the end of the blade that is hurting your hand. Maybe something similiar to the one in this picture. Just a thought. Is it called bullnose because of the shape? I have been wanting a small plane to trim 1/4” solid edging applied to plywood. I clearly dont know much on planes, but that is pretty cool. @david_larch…Its called a bullnose plane because you’re supposed to be able to get right into a corner with it. I have a few of these and they are handy at times. 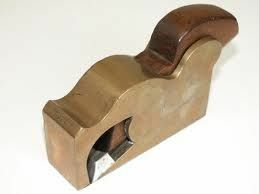 For trimming edge banding, I’d suggest a block plane. The Kunz was my first bullnose and have since bought several others from Veritas which are excexllent. The Kunz looks exactly like this Stanley except that it is green. Couple things about this type of plane. Make sure the bullnose is in contact with the board. I take the bullnose off and sand the sole with more pressure on the blade end. Check with a straight edge with the bullnose on and I stop when there is a good solid contact with the bullnose and there is a tiny bit of light on the blade half of the main sole. The plane should have most of its weight on the bullnose and the heel of the plane. Then adjust the bullnose as close as possible but still allow shavings through the crack. Shavings became much improved and the chattering went away. Planes cut much better when there is pressure on the board just before the blade. Plane without the bullnose and if it cuts the same with it on then the bullnose is not putting enough pressure on the board. The sole on Japanese planes actually have a tiny arch, about a thousandths or two to put more pressure before the blade. A tool master taught me this in Japan and it sounded so strange at first but all of my Japanese planes began cutting much better and you don’t have to press down as hard as you plane. One of the reasons why they cut so well. Second thing is that you can take the bullnose off to cut what’s left with the bullnose on. Doesn’t shave as well for the above reason but it’s only the last 1/4”.